Starbucks Banana Walnut Bread to enjoy with a cup of coffee at Starbucks. Starbucks Banana Walnut Bread is one of my life’s little pleasures. Freshly baked Starbucks banana bread is hard to beat. Starbucks Banana walnut bread isn’t difficult to make, in fact you can make banana walnut bread that will taste just like Starbucks. Starbucks, of course, is everybody’s favorite coffee shop and there’s one or more in every neighborhood. If you want a tasty something to go with your grande cappuccino, Starbucks offers some delicious breads and cakes – classic coffee cake, cinnamon swirl coffee cake, pumpkin bread, caramelized apple pound cake, iced lemon pound cake, double chocolate chunk brownie, and my favorite banana walnut bread. Starbucks banana walnut bread is one of my life’s little pleasures. Combine this delicious, moist bread with a perfect Starbucks venti caffè latte to make a bigger pleasure. Freshly baked Starbucks banana walnut bread is hard to beat, and you can enjoy it freshly baked any time if you make it at home. It’s not difficult to make, and it will taste just like Starbucks. 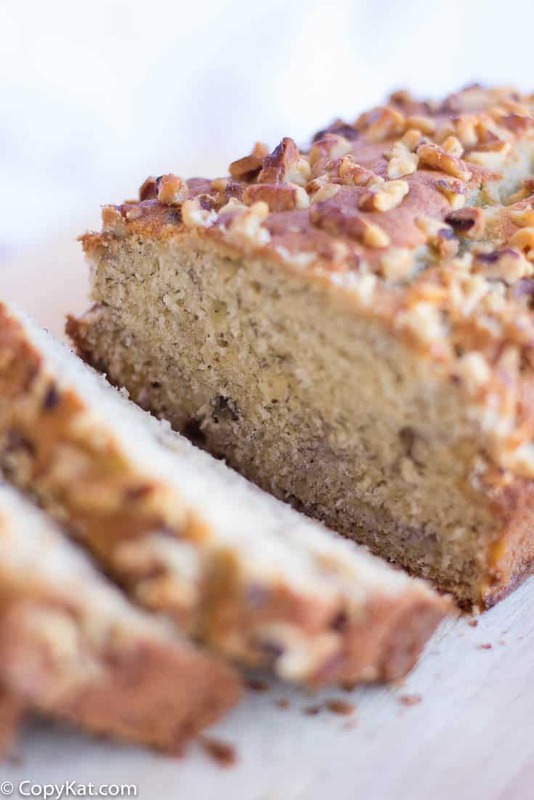 In fact, it will be even fresher because you can enjoy this banana walnut bread while it’s still warm out of the oven. I recommend using bread flour if you have it on hand, as it gives the bread a more dense, chewier texture. If you don’t have bread flour in your cupboard, you can use all-purpose flour, and the banana walnut bread will still turn out just fine. You can even improve on Starbucks banana walnut bread by using bananas that are overripe as the overripeness definitely enhances the flavor. It’s a very good way to use up those bananas that have been lying around because you’ve forgotten all about them. They look unappealing in their brown spotted skin, but they’re perfect for making banana bread. If you don’t have overripe bananas, you can use regular ones, but they won’t make the bread taste quite as good. Enjoy Starbucks? Be sure to try these other great copycat recipes. 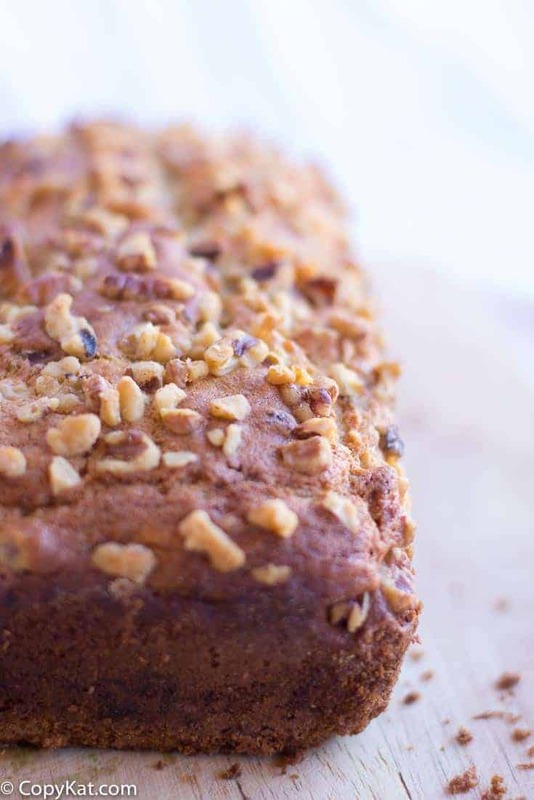 Starbucks Banana Walnut Bread is so easy to make at home. You are going to love how tasty this bread is. In a medium-size bowl combine all dry ingredients (flour, baking powder, baking soda, and salt), stir together to combine. In another medium-size bowl combine margarine and sugar, with a mixer cream the margarine, and sugar together until light and fluffy. Add in mashed bananas, eggs, milk and mix well. Add 1/2 of the dry ingredients into the wet ingredients, mix until the flour is just mixed in, then add in the remaining flour and 1/2 cup walnuts, blend together until everything is mixed together. Do not over stir. Pour batter into a greased 8x4 inch loaf pan. Then top the batter with the remaining chopped walnuts. Bake at 350 degrees for 55 to 60 minutes or until a toothpick inserted near the center comes out clean. Cool for 10 minutes on a wire rack. While Starbucks does not make their banana bread with butter, I think this comes out richer this way. I also like to add in a sprinkle or two of cinnamon and sugar into this, again, not in their recipe, it does add that little something extra. I made this and after reading the comments, added vanilla and a hint of cinnamon. My granddaughter doesn’t like nuts in things yet, so I left them out and did what they do in the Caribbean, and added coconut. It turned out just fine and we loved it. I will make this again with and without nuts, maybe with both nuts and coconut! Thanks for putting this together. I am glad you like the recipe. We also used real butter and a teaspoon of vanilla. After pouring our mixture in the greased pan we added a “vein” white chocolate down the middle. Absolutely amazing!!! Yes, agreed on a very unhealthy level but this will definitely woo your guests and be worth the extra steps in the gym. Great recipe. I’ve made it many times and sprinkled a little cinnamon sugar on top. Cannot keep enough of this around and my work family loves it as well. Thank you for such a great recipe. It’s a keeper. Thanks for this great recipe. This is my second time making it. I fudged this time. I made two loafs: one with pecans and one with no nutshell at all. Thank you for sharing this recipe. This is the second time I’m making this awesome banana bread copycat from Starbucks and both times it came out wonderful. Made w butter instead and this is now my goto recipe for banana bread everyone loves and it looks beautiful too ! It completely collapsed in the middle and was just awful. Not sure why. I made your delicious Banana Bread this morning to appease the gods of 2018 and use up my browned bananas. I added 2 tablespoons of light brown sugar and a teaspoon of vanilla to your recipe. I also dusted the pan with cinnamon sugar before turning the batter into the pan. It looks beautiful. Usually, banana bread is better the next day. This is delicious and moist not even completely cooled. Absolutely yummy! Thanku for sharing this fantabulous recipe! Everyone loved it and easy peasy to follow. Cheers! It was the best ever ,i give you 10 stars. Woooooooow.thank you a thousand times. I added chia seeds (about one tablespoon each time when adding the walnuts) and a teaspoon full of vanilla when mixing the eggs.